At this year’s ACHEMA in Frankfurt, Fristam Pumpen showcases for the first time a series of magnetically coupled pumps. Recycling of cars made green & cleaner with Verderflex peristaltic pumps. Super duplex pressure regulator valve for oil industry offshore reverse osmosis package. Karyn Ovelmen is joining Flowserve Corp as executive vice president and chief financial officer from 1 June 2015. Low sound with Gardner Denver Thomas 1610 pump. New canned motor pumps for chemical and process engineering applications. Sealing specialist AW Chesterton Co has broken ground on a major expansion project at its Groveland facility in Massachusetts, USA. Energy Recovery Inc has appointed its chief financial officer Joel Gay as the company's new CEO. Mertering pump manufacturer Milton Roy has been profiled on the “World’s Greatest!” technology television program. Hasan Avci is to head up Grundfos’s strategy, commercial excellence and marketing functions in the Asia Pacific region. Oil and gas equipment specialist NOV will be showcasing a new impeller at a major trade fair. Xylem unveils new interactive dewatering web platform for an improved customer experience. Denmark's DESMI A/S posted a 13% increase in 2014 turnover to DKK908 million, while profit after tax was up almost 34% to DKK46.3 million. Lewa GmbH has been certified by the TÜV (German Technical Inspection Association) to the occupational health and safety standard OHSAS 18001:2007. A lightweight, compact pump with flow rates of up to 700 ml/min has been launched by Clark Solutions. Xylem Inc is taking part in the US Presidential Trade Mission to China, which is taking place 12–17 April 2015. ITT Corp’s Goulds Pumps, PRO Services and Bornemann brands are observing the fourth-annual Pump Appreciation Day today. Precise low-pressure chromatography system for fast and safe purification of biopharmaceuticals in the GMP field. A United States brewery has returned to Germany to for the installation of pumps in its second operation. 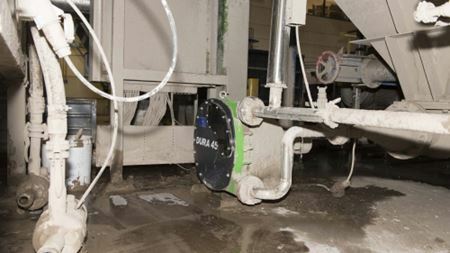 Positive displacement pump specialist Mouvex has added a new model to its A Series eccentric disc range. The green technology firm has started work on a desalination plant in Morocco. Thousands of delegates from around the world are expected to attend a major exhibition in Abu Dhabi. Centrifugal single stage pumps for drainage and slurry water for dry installation launches at WETEX in Dubai. Sulzer has acquired the French rotating equipment services company Matis Interventions Sarl. Kirloskar Brothers (KBL) has won a major award for quality. Energy specialist Galenfeha has unveiled a new intelligent chemical injection control system. SPP Pumps is now manufacturing its standard pump product range for stock giving customers fast access to pumps from the company’s base in Coleford, UK. Pentair’s Aquatic Systems division has won an award for cutting greenhouse emissions. A new method of extending the service life of pumps and compressors has been launched by Picosun. Hayward Tyler has opened a new sales office in Shanghai, China, to complement its existing service and overhaul facility in Kunshan. Engineering consultants Mott MacDonald have been appointed lender’s technical advisor for the development of a desalination plant in Morocco. A train using a custom-built water jetting system from Hughes Pumps is being used to clear track leaf mulch from a major light rail system. More than 1,000 exhibitors will attend a major water conference and technical exhibition. Veolia has selected Xylem as a preferred partner under a three-year global contract. The 2nd International Conference on Desalination Using Membrane Technology will take place in Singapore 26–29 July 2015. Metso Corp is opening a new valve and field device service centre in Querétaro, Mexico. A new micro-valve specifically designed for use in laboratories has been launched by Bürkert.